One of my favorite autumn traditions is baking, especially apple cakes. We've been waiting out a storm the past days here in Oregon, and what better activity is there then, if not to bundle up in the kitchen? 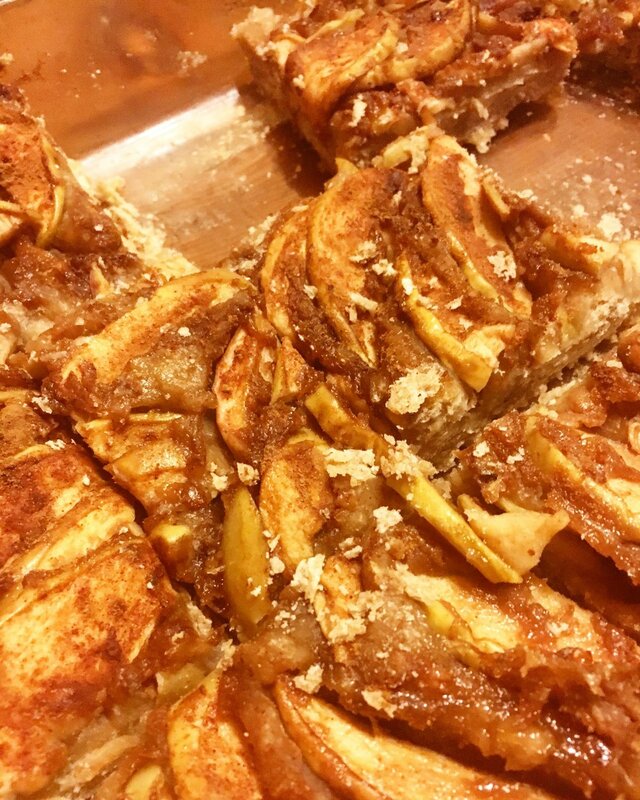 I used to bake a less balancing apple cake recipe for years, this is a modified refined sugar free and vegan option. I didn't have any ghee available, if you do, it will work a lot better then the coconut oil. Coconut oil is cooling, and during rainy windy autumn days, cooling down is the last thing I'm interested in. As a vegan option though, coconut oil or sunflower oil will do the trick. Cinnamon, ginger and cardamom (the least warming of these spices) are all warming spices. They aid digestion, ground and comfort us in stormy weather. May it be outside our door, or when life in general feels stormy. Ayurveda recommend to have fruits on their own away from other foods. Therefore it's best to bake fruit cakes with ghee as the only animalistic ingedient, or keep them vegan. Notice how you feel after having the cake. For some of us this will feel ok since the apples are cooked, and for some of us not. Have the cake when your digestion feels strong, ideally in the mid afternoon or morning as a snack. Set the oven temperature to 350' F (175' C). Heat up the coconut oil (or ghee) in a pan. Add the cinnamon, cardamom and ginger and sauté the spices until the aroma comes up. Mix the flower, oil, salt and spices, apple sauce, water and the maple sirup together in a big bowl. The consistency should be sticky, but not so sticky you can't get it of your hands. Add into a large baking tray, spread the dough thin and even. It will only be about 2 cm(an inch) high. Spread the cut fresh apples on top and press them gently into the dough. I like to make a swirling circle with them, but any shape is beautiful! Be creative and give loads of love to your creation. Let the tray bake for 20-40 min, depending on your oven and how big your tray is. The apples on top should be lightly crispy and a toothpick come out clean from the dough. Serve cold or warm as it is. Chew well and have it with your meal, or 2-3 hours apart from other meals for optimal digestion. In sweden we traditionally serve pie with vanilla sauce. We made some vanilla yoghurt here and it worked well too.